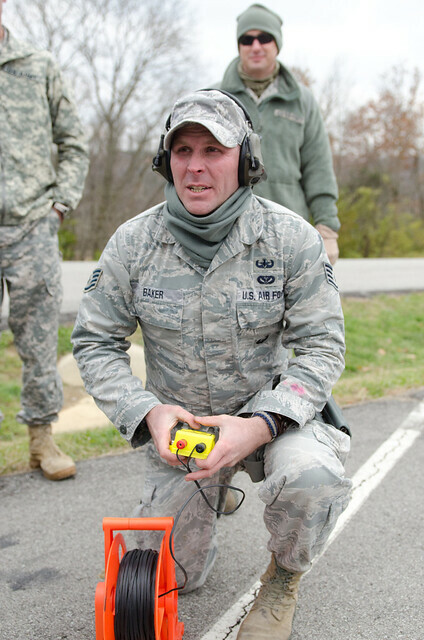 KENTUCKY AIR NATIONAL GUARD BASE, LOUISVILLE, Ky. — The Kentucky Air National Guard has a new piece of equipment that allows specially trained Airmen to safely detonate bombs and other explosives without harming nearby personnel or structures. The gear, known as a Bomb Containment Vessel, does exactly what its name implies, according to Staff Sgt. Timothy Baker, an Explosive Ordinance Disposal technician for the 123rd Civil Engineer Squadron here. The capability can be especially useful if EOD is called upon to dispose of explosives in populated areas like the city of Louisville. “If an improvised explosive device or any other sort of explosive is discovered anywhere in the area, EOD can destroy those explosives in a safe and contained manner without the worry of the destruction of any structures or bodily harm to bystanders,” Baker said. The Kentucky Air Guard’s EOD team is one of the first three Air Guard units to receive the vessel, he added. Prior to its arrival, only one other Bomb Containment Vessel existed in the state of Kentucky. The vessel is a trailer-mounted metal sphere with four-inch-thick steel walls. To make an explosive “safe,” EOD technicians carefully place the device into the vessel, seal the door and detonate it remotely. The vessel can be used repeatedly for the disposal of up to 10 pounds of TNT-equivalent explosives without compromising its structural integrity, Baker said. For explosives of up to 20 pounds, the vessel can be used safely only once without being inspected for damage. It can be operated in a vented mode, to allow gases from an explosion to escape into the air, or in containment mode to prevent release of suspected chemical, biological or radiological contaminants. 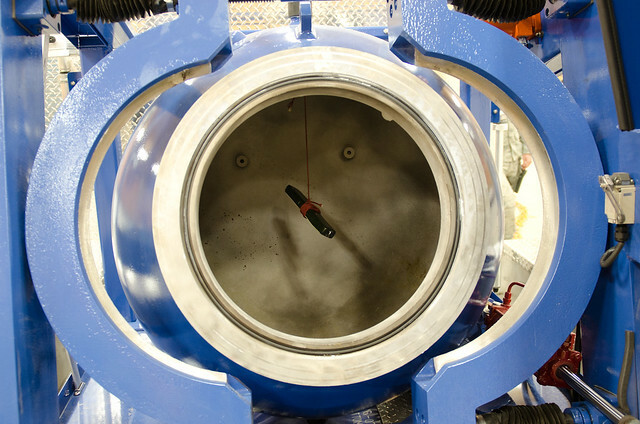 The vessel also includes ports from which inside air samples can be extracted, or through which solutions can be pumped to neutralize threats. “As soon as we received this piece of equipment, we reached out to all local law enforcement agencies, informing them of this new capability and the fact that we could aid them in responses as needed,” Baker said. Maj. Keith Smith, commander of the 123rd’s Explosive Ordnance Disposal Team, said the vessel makes the unit even more effective in its dual mission of protecting military personnel from explosive weapons and in assisting civil authorities by neutralizing all manner of explosive devices. “The total containment vessel drastically upgrades our capabilities to deal with explosive devices by allowing EOD techs to either contain a blast or transport the device to a safe location for disposal,” he said.